And we are back this week with the second part of our Summer Bucket List! Develop a multimedia-based projectWe’re always blogging about our favorite multimedia tools (most of which are free and available on the web!). Try out a couple out this summer – find out what you might like to use in your classroom, or even better, how you might integrate these tools in a project for students! Students perform better when they are challenged and able to be creative. There are tons of free web-based resources and tools offered through UIS to help get them started—they just need you to provide them with the project! Follow our blog for ideas, and please reach out to us if you are interested in creating a project or using a tool, but don’t know where to start! Create your own InfographicWe are always sharing awesome infographics because they are such a neat way to actually visualize facts and figures. And, infographics have become so popular, there are different tools out there available to help you create your own! These are great additions to add to presentations, websites, and other class materials. Or, even try challenging your students to create one of their own.Infogr.am is one of our favorites—it’s free and so simple to use! Simply add data, choose how you wish to visually arrange it, and then quickly share it! Additionally, web-based programs like Visme (formerly EWC Presenter) has a feature built-in that allows users to create infographics within their presentations! 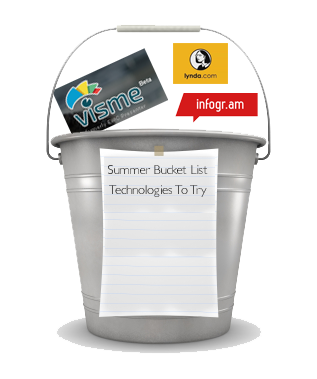 Try out lynda.comThe summer is the perfect opportunity to spend some downtime catching up on new programs and brushing up on computer skills. At UIS, we offer access to lynda.com — an excellent resource that provides on-demand training 24/7! With lynda.com, choose from tons of software applications as well as productivity skills, customize your own training program, track your progress, and always pick right back up from where you left off!